The U.S. Court of Appeals for the D.C. Circuit heard oral arguments Thursday in a case seeking to remove Mick Mulvaney as acting director of the Consumer Financial Protection Bureau (CFPB). The case was brought by Leandra English, who was acting director last year when the agency's first and only director, Richard Cordray, resigned. But before English could take the agency's reins firmly in her grasp, President Trump installed Mulvaney, who also serves as budget director, as the agency's acting director. English sued the President, charging that his appointment of Mulvaney was illegal because Congress established the consumer agency to be independent of both Congress and the Executive branch of government. English is not only suing to reclaim her job; she also seeks to change the CFPB's direction under the Trump administration. Democrats and consumer advocates charge Mulvaney has pulled the agency back from its mission to protect consumers from financial abuses. Mulvaney told Congress this week he thinks the agency has too much power and should be changed structurally so that it is accountable to Congress. At the beginning of the oral arguments, which were streamed online, justices asked English's attorney, Deepak Gupta, how his client had standing to bring the suit. "She is seeking to establish her entitlement to a position she believes she lawfully holds," Gupta said. "That is the legal question here." Gupta said his client is seeking a temporary injunction that would make her the acting director. "The injunction would prevent Mr. Mulvaney from holding himself out as the director of the CFPB and occupying that position," Gupta told the court. "And it would restore Ms. English to what she believes is the status quo." In their questions and comments, the justices appeared reluctant to tell the President who he can appoint to a position, suggesting the case hinges on successfully making the case for an injunction. 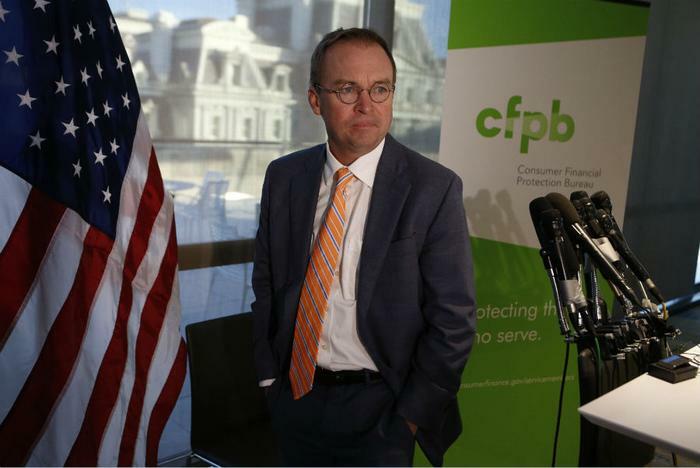 But in later questioning, two of the judges on the panel seemed to question the legality of Mulvaney's appointment as CFPB acting director, noting that he also serves as Director of the Office of Management and Budget (OMB). The law that created the CFPB specifically stated that the OMB should not have jurisdiction over it. As for Mulvaney, he spent a second day on Capitol Hill -- this time testifying before the Senate Banking Committee, of which Sen. Elizabeth Warren (D-Mass.) is a member. It was a highly anticipated showdown, since Warren conceived the idea for the agency's creation, which was a target of Mulvaney and other Republicans from the beginning. "In Congress, you tried repeatedly to kill the consumer agency," Warren told Mulvaney. "But here's what you don't get, Mr. Mulvaney: this isn't about me. This is about active-duty military, it's about first responders, and students, and seniors, and families-and Ari, and his dad, and millions of other people who need someone on their side when consumers get cheated." The exchange between Mulvaney and Warren highlights the long-standing conflict between consumer advocates and Republicans on the need for an independent consumer protection agency. Mulvaney pointed out there are other federal agencies that protect consumers. Warren suggested those agencies have failed in that effort.